I love product development and it is one of the most enjoyable aspects of my business. It means I get to sit there with my pencil and paper doodling ideas and sketching the finished product. I use coloured pencils to play around with colours so I can get the contrast right. I’m not an artist and my drawings may look as if a five year old has done them but they help me create the vision of what the finished product will look like. In my minds eye they don’t look like a five year old has done them thankfully and it’s that vision that helps me create beautiful pieces that I know my customers and family will love. It was my daughter who persuaded me to start to draw my ideas down on paper as she said it would really help me create them and bring them to life in my mind. And she was right and I’m so glad I didn’t let not being up to artist standard hold me back from giving it a go. Being a crafter means I am always looking for the best materials to work with that are not only good quality but enjoyable to use too. I make a wide range of products from Swarovski crystals vegan silk clay jewellery (no silk worms here but refers to texture) polymer clay fridge magnets to hanging mobiles for babies. In this blog I’m going to look at product development which includes the type of materials I am using and at present sourcing. I am also going to give you some product development tips in-case you want to have a go at making your own. I’m just in the middle of making my baby hanging mobiles however they are also great for adults too. I’m making my grown up daughter one for her bedroom. They take about 10 hours or more to make as they are hand made and hand painted but they are very relaxing to do. And the one below is a work in progress. I originally made four horses (all baked in my oven) and realized that it would look more balanced with another four so I am just in the middle of making them. Here’s me painting my figurines for my hanging mobile. These are still being painted but I’m nearly there. I originally sanded and painted the wooden hoop I am hanging the figurines from. I wrapped a beautiful gold shimmer ribbon around the centre of the hoop so the pink paint would still be visible either side. However although it looked beautiful it didn’t match the vision in my head. I knew I wanted this product to be very eye catching for little ones to bring them a source of pleasure and entertainment when they are lay in their cots or beds. And having had my own child I knew babies loved anything sparkly and it would capture her attention for a long time. I envisioned beautiful glitter flags around the hoop that would give a canopy effect so the hunt was on for the material that I could use. I came across glitter felt and it felt like being a child again in candy land. Felt on one side and a beautiful glitter on the other side. The felt is really easy to work with and great to trace around my hand made template triangle (for the flag canopy). It is easy to cut and my scissors glide through it. 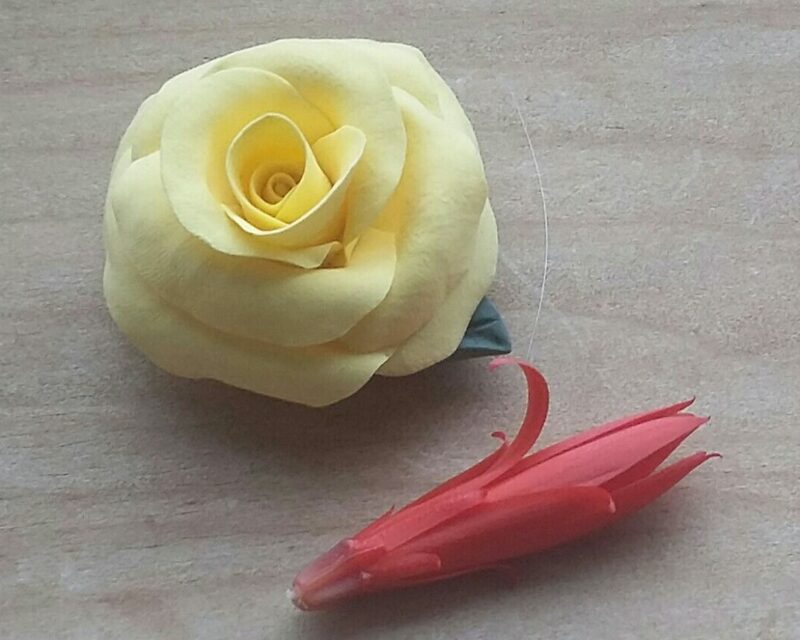 I currently work with Fimo which is a polymer clay but I am always always sourcing out different materials. I recently sent away for some air dry clay but I didn’t enjoy working with it. It cracked very easily so I had to keep using lots of water on it which I enjoyed. However it didn’t do very well in the moulds and because some of my silicone moulds are very deep it didn’t dry properly. I am just looking at porcelain clay now which is vegan and if I like it then there are plans to make the figurines on the hanging mobiles out of it in future. As soon as the project is complete I will write an article on it so you can see my finished creation. Perhaps your thinking about starting your own project but not sure how to get started. I thought I would give you some product development tips that have helped me enormously. Look round on the internet or in magazines to help generate ideas. Don’t copy though. It is nice if your work is original. It can be similar but have fun adding your own twist to it. Sketch your ideas. It doesn’t matter if you can’t draw as only you is going to see it. You will find it helps construct the vision of the product in your mind. If your planning on selling your product decide how your going to price yourself? For example work out how much something costs you and then selling it a price that you make a profit on. Or alternatively charge an hourly rate if the project takes a couple of hours to make. If your planning on selling what you make ensure you do your market research and find out who your target audience is and also whether there really is a need for your product. Take lots of walks in nature. All of that fresh air increases energy and adds oxygen to the brain cells which means more thinking power. With more thinking power you’re more likely to be able to use your imagination to come up with something beautiful. If making jewellery think about using a bead design board. It allows you to play around with your designs before you string them. I have one of these and it makes the design stage so much easier. 8. Learn how to do meditation and do it every day. It will clear you mind and without the sea of endless thoughts ideas will come more readily. It will replenish you thus helping you be more productive. I no longer work with Fimo as have discovered it has animal by products in but instead now work with cruelty free clays. 6 top tips on how to get creative with your children! In this blog I’m going to take you behind the scenes and tell you how I make my faerie jars. Plus I will be introducing you to my magical little helpers. All of my faerie jars are bespoke and made to order and are a fun way to spend the day. I will also give you some tips for gaining inspiration just incase you want to get creative yourself. I recently received a lovely project from a lovely customer to make some faerie jars for her children. She asked me and my little helpers (The Earth Faeries) plus the children’s tooth faeries to make some faeries jars for her children. So together with the rest of my faerie helpers we sat at my kitchen table surrounded by glitters and beautiful colored cords and other fun craft stuff. We got to work with a smile on our faces. Pearl Luster was very helpful she fluttered over to the glitter and accessories and brought them over to our table. I chose silver and gold cord for each bottle and I braided the cords. Crystal Moon Wand helped by pouring the glitter into the jars. We also had a guest appearance from two of the little girls tooth faeries Butterfly Wand Queen and North Star Glitter who wrote the letters to the children. Our guest stars chose the colours of the glitter and colour of the cord. Myself and my team of other helpers cut the A4 paper into long strips and coloured the paper to give a lovely authentic look to the scrolls. I like to use tea bags to colour the paper as they really do give the scroll a lovely old authentic look. Then our guest stars the tooth faeries took the scrolls out into the garden and began to write their lovely letters to the children. After that it was handed to me, I rolled it into the scroll and Crystal Moon Wand tied the silver and gold cords around the scrolls. We all held the scissors whilst we cut the cord. It really was a team effort. Then afterword we all went out into the garden again to take some pictures of what we had made. Over all it was a fun productive and creative day. I’d like to say a big thank you to my helpers Crystal Moon Wand, Pearl Luster, and our guest star tooth faeries North Star Glitter and Wand Butterfly Queen. They were a great team to collaborate with. And an extra special thank you to all of them for sprinkling their magic on the beautiful faerie jars so that it brings the children much good fortune and prosperity. I’m looking forward to our next collaboration. And if you fancy getting creative and having fun with your children. Here are some great tips to help you along. In the summer months why not put a blanket on the grass in your garden and work on your projects there. Go for a walk in nature first. All of the oxygen is great for the brain cells. You’ll find not only will you have more energy to complete the project among-st other things as well but you will have more thinking power too. Make sure that you have all of the materials needed in one place next to you to save having to get up all the time. It conserve energy so you have more of it to enjoy your fun projects. Look on line or in magazines for projects or ideas. Let your imagination have free reign. Have you embarked on any fun creative projects lately? If so please share as I’d love to hear more about it. Since writing this article I no longer supply normal glitters which are harmful for the environment. I now use biodegradable compostable glitters that are eco friendly.